The Andrews Pages Picture Gallery : Derbyshire : Ashbourne - Church Street Almshouses, early twentieth century. 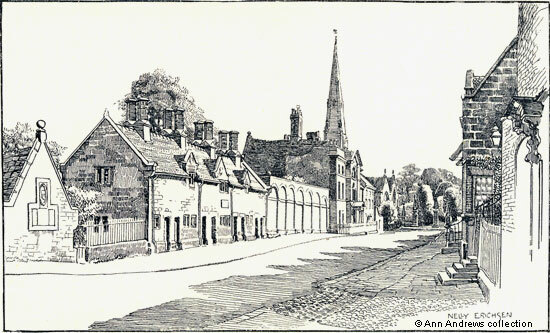 Ashbourne - Church Street Almshouses, early twentieth century. "The Lower Story [sic] of these houses erected A.D. 1640. Repaired and the Upper Floor Added A.D. 1848". Sideways to the street, on the left of the engraving, are the single storey Pegg's Almshouses that were erected almost sixty years later in accordance with the Will of Christopher Pegg Esq, of Middle Temple London, dated 12 June 1699. Next to them is a brick wall with blank arches which once housed The Mansion's stables. Then comes The Mansion and St. Oswald's Church, which has a lovely set of wrought iron gates dating from about 1700, is further along. The churchyard, filled with daffodils in the Spring, has many tombstones and inside the church are some very fine monuments, especially those to the Cockayne and Boothby families that are in, and just outside, the Boothby chapel in the North Transept. Of especial interest to many is Joseph Bank's white marble carving of Penelope Boothby dating from 1791 (see on site image). There are other almshouses in Church Street and School Lane, notably Spalden's and the Clergy Widows. Amelia Taylor (both 76) and Mary Hall (72). All three were widows. Below are details of the various bequests made and other details regarding Owfield's and Pegg's almshouses, extracted from Kelly's 1912 Directory. Owfield's :-Roger Owfield, by will, dated prior to 1630, gave £100 to build almshouses for eight poor people of Ashbourne, which were completed by his widow at her own expense: Thomasin Owfield, by deed, 28th January, 1630, made over one almshouse and £100, to pay the almspeople £1 each; Samuel Owfield, by deed, 2nd November, 1640, granted two messuages and a piece of land to the trustees of the Grammar school to maintain the same ; altogether Thomasin Owfield built 8 almshouses, which are all occupied [i.e. in 1912]; Paul Taylor, by will dated 24th December, 1640, gave £12 10s. the interest amounting to 2s. 6d. each, to be given to the eight almspeople every Good Friday, and this sum was augmented by Robert Webster in 1659 to £13 10s. : John Owfield and William Owfield, on the 7th June, 1652, granted 7 acres, supposed to have been substituted for the £100 left by Thomasin Owfield as above: George Taylor by will dated 2nd March, 1668, gave £100 to pay 1s. annually to each of the almspeople: Jane James, by will dated 13th July, 1669, gave a yearly rent-charge of £2; Richard Peters, by will dated 18th May, 1708, gave the yearly sum of £4; Nicholas Spalden, by will 16th April, 1710, gave 13a[cres]. or 34p. at Parwich, realising a yearly rent of £39 ; these gifts being intended for the benefit of Owfield's almspeople ; the whole rents (with the addition of the amount left by Edw. Corden) now allows a weekly sum of 4s each to the eight tenants, the surplus being applied to repairs. Christopher Pegg, by will dated 12th June, 1669, directed six almshouses to be erected on his property in Ashbourne for six poor inhabitants of the town, and for their maintenance gave his farm in trust, now producing £193 15s. yearly [this was in 1912], two-fifths of which goes to the Grammar school. German Pole, by will dated 6th October, 1682, gave 29a. or. 30p. the rent to be distributed amongst the six alms people: part of the ground belonging to the almshouses produces two guineas a year, which is also divided among the almspeople: altogether each tenant receives about 5s. a week. Stephen Glover, in 1833, gave the date of the bequest by Roger Owfield as 1630, which agrees with the Kelly's date. He added that each almshouse had a small garden and they were to be inhabited by poor widows or widowers. The Pegg almshouses have a garden in front. In 1912 "every third vacancy in Owfield's almshouses is filled up from the widows or widowers in Spalden's Houses". In 1846 the annual meeting of the Ashbourne and Wirksworth Society for promoting Christian Knowledge decided that Bibles and Prayer books were to be allowed in these almshouses. They were, however, to belong to the houses and not the occupants. had been given by Roger Owfield and Thomasine his wife. 1. "Church Street, Ashbourne". Illustration by Nelly Erichsen, published in J. B. Firth's 1908 book. 2. 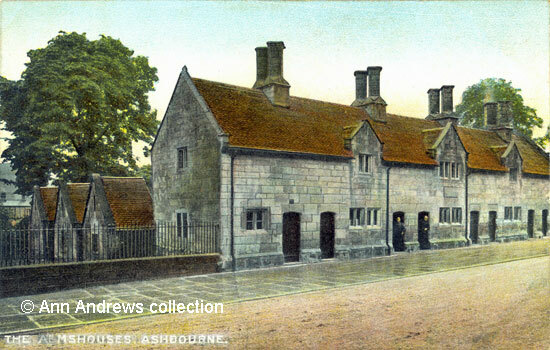 "The Almshouses, Ashbourne". Artistic Series, A.P. Co., 9 Bury Court, St. Mary Axe, London, E.C., No.2244. Chromotyped in Saxony. Postcard was unused. No date but before WW1 and probably no later than 1910. 2. 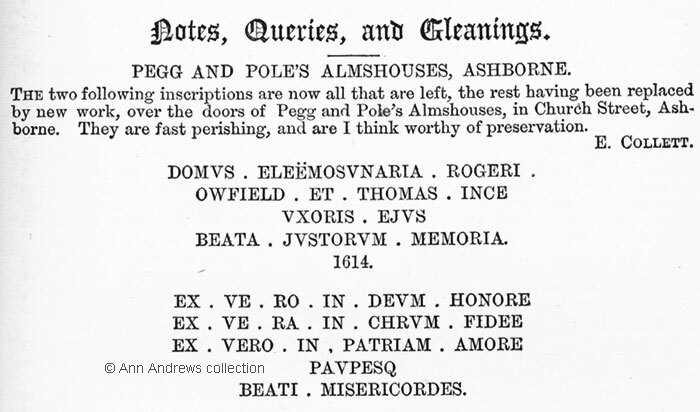 Almshouses Inscription from The Reliquary, Quarterly ournal and Review Vol. 6". (1865-6) Ed. Llewellynn Jewitt, F.S.A. Published London: John Russell Smith, 36 Soho Square Derby : Bemrose & Sons, Irongate. Images in the collection of, provided by,and page researched and written by and © Ann Andrews. Cox, John Charles, (1915, 2nd edition, revised), "Derbyshire" - Illustrated by J. Charles Wall, Methuen & Co., London. Pegg's Will was proved 18 May 1670 in the Prerogative Court of Canterbury (PROB 11/333/44). Pegg was the son of Edward Pegg of Ashbourne and attended Repton School and then St. John's College, Cambridge, graduating with a B.A. in 1662 (this from Venn's "Alumni Cantabrigienses: A Biographical List of All Known Students, Volume 1"). He was unmarried. The 1911 census is available on Find My Past. TNA holds the Will of Thomasine Owfield or Owfeild, Widow of All Hallows London Wall, City of London (PROB 11/178/313). Probate granted 9 November 1638. Thomasine was a widow as early as 1612 (this from a Teller's Bill). In addition TNA holds Certificates of residence showing her to be liable for taxation in London for the years 1624, 1625, 1628 and 1629 and in all cases she was a widow. There was also a pleading (Owfield v Crouch) dated 1621-5 indicating her status, so she was quite an independent woman in her widowhood who dealt with her own affairs. Will of German Pole of Radbourne, Derbyshire. Probate at TNA 16 April 1765 (PROB 11/908/93). "Derbyshire Advertiser and Journal", 14 January 1846. Firth, J. B. (1908) "Highways and Byways in Derbyshire" MacMillan & Co., London.